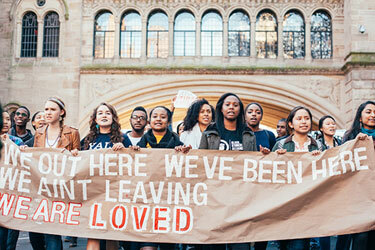 “March of Resilience” protesting Christakises’s calls for Free Speech at Yale. Bill Jacobson reports that the Trump Justice Department may be about to start making colleges resume admitting people on the basis of the content of their character, rather than the color of their skin. If a report in the NY Times is accurate, the Trump administration is getting ready to take on the most precious of liberal dogmas, the institutionalized racial discrimination in college admissions, aka affirmative action. There is the predictable freak out, particularly from virtue-signaling white liberals. The Left is going to have a cow. 3 Feedbacks on "Apparently, Some People Are Going to be Loved a Lot Less"
Bilderback — What do you expect from a $250,000 education paid for by someone else? The problem is really as simple as this: many people use race baiting for fun and profit. We all know who those race baiters arre who have profited from this practice. Now you are seeing college kids using violent race baiting for fun as in “get whitey”. It is what is often somewhat incorrectly called “reverse racism but in fact is simply racism. Blacks ganging up to take over meetings, invade private gatherings, and accost white people in public. This technique depends on first scaring the authorities into not reacting/enforcing the law and then to berating and even beating the miscreants (white folks). This isn’t going to end well. Either the authorities need to start doing their job or we will see more people choose to defend themselves.